EVERGLADES CITY, Fla. – In the wintertime, thousands of tourists swarm Everglades National Park for a dose of greenery, wildlife and outdoor beauty. As South Florida is known for its desirable temperatures this time of year, which often hover around 75 degrees, a journey through Florida’s swampland is a welcomed adventure. However, many do not realize that less than two miles from the Everglades’ widely popular airboat tour stop, located on the park’s West Coast section, is a small local hub for fresh and tasty seafood. 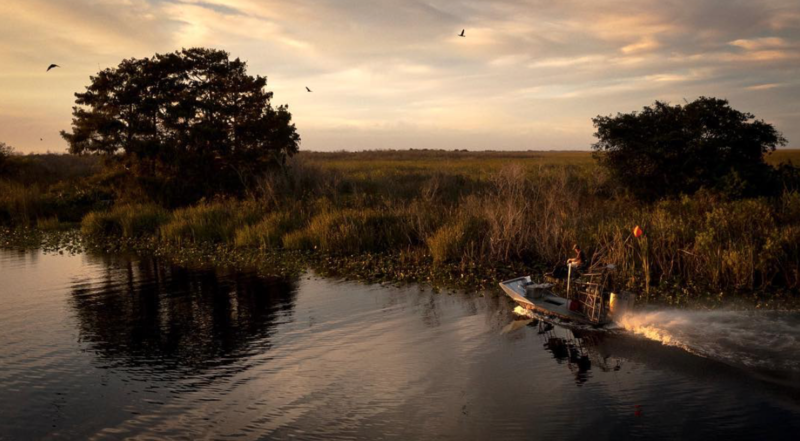 On the way into Everglades City, travelers find vast open land with many areas to explore via an airboat (Photo by Clarissa Buch). Although Everglades City is home to less than 500 residents, there are multiple eateries that offer an array of freshly-caught seafood, including traditional favorites such as stone crab and shrimp as well as more exotic offerings like frog legs and Florida gator tail. Besides the Everglades’ established airboat stop, the city is conveniently located less than a mile from the Everglades National Park Gulf Coast Visitor Center and the Everglades City Airport, which are two vital entry points into the park’s western end. Whether you are starting an excursion or nearing the end of a trip, stopping in Everglades City for a traditional seafood meal should be on the top of every visitor’s to-do list. What leaves many stumped is choosing between restaurants, as many offer similar plates and atmospheres. However, when taking a closer look, each eatery possesses features that set it apart from the locale next door. One of the most beloved Everglades eateries is Cameilla Street Grill. Bordering Lake Barron, the eatery highlights local wildlife and seafood at moderate prices. Its menu widely consists of finger foods, seafood and pasta dishes, as the restaurant features a fusion of southern and Mediterranean plates. According to restaurant staff, many of its menu items are sourced straight from the Everglades’, obtained either from local fisherman or alligator trappers. Armando Perez, a 46-year-old Miami native, often dines at Camellia Street Grill when he brings his family to the national park. It’s a getaway he and his family prefer take this time of year. Less than half a mile away on the west end of town, find the Everglades Rod and Gun Club. Often visited by U.S. presidents and famous writers, musicians and artists, including Burl Ives, Ernest Hemingway and Mick Jagger, the hotel and restaurant has been a staple of Everglades City for more than 100 years. What is unique about the estate is it is in near identical condition as it was in the 19th century. The inside of the building is stocked with antiquities and historic memorabilia including old-style furnishings, wooden floors, stuffed animal heads, old maps and rifles. The property includes a 169-seat restaurant, which directly overlooks the Barron River. It is the annual site of the “Blessing of the Stone Crab Fleet,” which attracts hoards of local fishermen and seafood enthusiasts before the start of the stone crab season. If you happen to fancy finishing, bring in your local catch and the restaurant will cook it for you for just under $20, too. Luke Hartman and his wife Leslie, who went fishing in the Everglades on a recent Saturday, caught a large snapper and brought it to the restaurant to fry. A few steps away from the Everglades National Park Gulf Coast Visitor Center, find the Oyster House Restaurant. It is the most casual eatery of the three, offering a laid-back spot fit for relaxation and a cold beer after a day of swamp adventures. The restaurant is known for its inventive creations using gator meat. Consider sautéed gator, which is smothered in a garlic and oil sauce. Or, opt for gator tacos that are hand-battered and deep-fried until golden brown, stuffed in a taco and topped with a zesty sauce. There is a traditional gator plate too, which fries bite-sized pieces of gator meat with a serving of French fries. As Everglades National Park is one of Florida’s most popular nature destinations, every park-goer needs a place to recharge and refuel. If you find yourself near the park’s West Coast and the Ten Thousand Islands area, consider stopping in Everglades City and visit one of three beloved establishments. It is the perfect way to satisfy an appetite and give your body some rest. Monday through Friday noon to 9 p.m.
Sunday through Thursday 11 a.m. to 9 p.m., Friday and Saturday 11 a.m. to 10 p.m.
To get to Everglades City from the Miami-Fort Lauderdale area, head west on U.S. 41. From Naples or Fort Myers, take I-75 to U.S. 41.